SAFETY FOR THE WHOLE FAMILY. The second generation of the Sienna is one of the best vehicles that Toyota has produced. SIENNA 2005 - REAR VIEW. Folding the 3rd row seat, you will have enough space to store all your traveling stuff. The first generation of the Toyota Sienna was sold from 1998 to 2003. It was considerably smaller than newer models, and even though its wheelbase was five inches shorter, also had seating for seven passengers. The shorter wheelbase and a total width of 3 inches less, made the interior a tight space for large families. 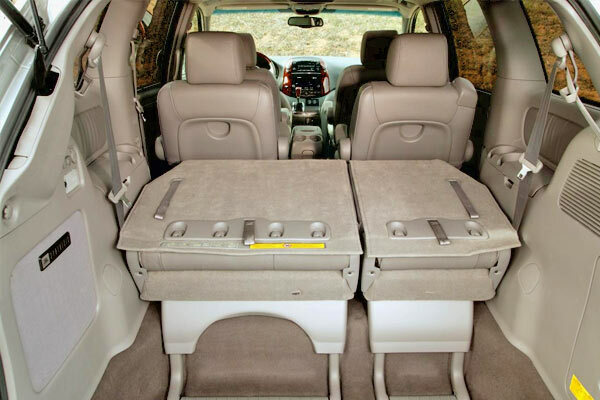 Unlike its major competitor, the Honda Odyssey, the last row of seats in the Sienna could not be folded to leave a flat floor, but its removable seats at least were light and easy to maneuver. The advantages of the first generation of the Sienna include excellent crash test scores, well soundproofed cabin, good power delivery of the 3.0-liter V6 engine with 210 horsepower and above average reliability. The disadvantages are that interiors are not very ergonomic, and the dynamic behavior in general is not firm enough. 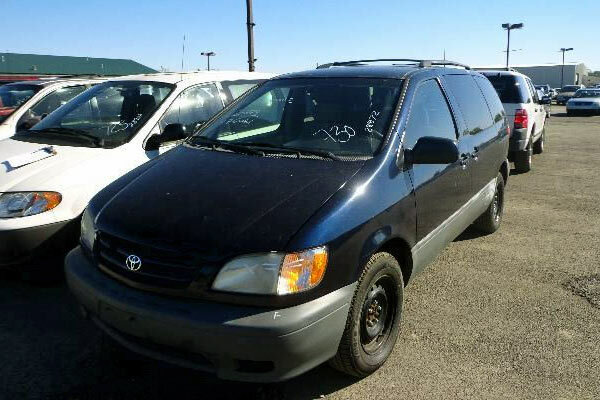 DEAL #1 - 1999 TOYOTA SIENNA LE UNDER $2,500. 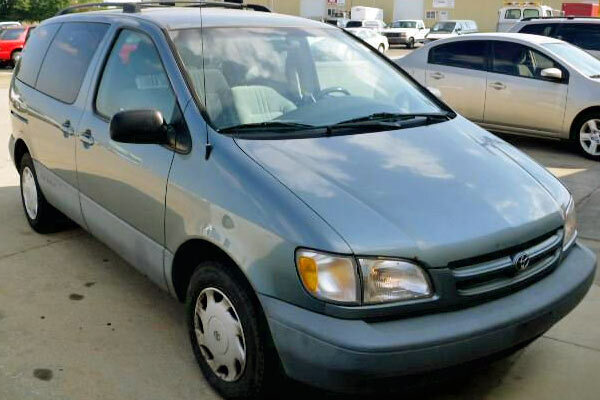 This used blue Sienna has 251k miles, and is being sold for only $2,495 by Hawkeye Auto in Marion, Iowa IA. If you are interested, please call directly to the dealer at 319-377-8564 or check its listing page to see more pictures and detailed information. If you are looking for a Sienna first-generation, it is important to note that the power sliding door on the right side was included from the 1999 model, while the side airbags for the front row seats and the stability control joined the list of options until 2001, the same year that was started to offer an entertainment system for rear seats installed by dealers, but as it was VHS, many buyers preferred to install DVD systems on their own. It is very important to check the maintenance history if you are planning to buy a first-generation Sienna, because a small percentage of these vehicles was susceptible to engine problems if oil changes were not made regularly. DEAL #2 - 2001 TOYOTA SIENNA LE UNDER $3k. The seller of this dark blue Sienna doesn't specify its mileage. It is being sold for only $2,500 by South Chicago Auto Auction of Harvey in Harvey, Illinois IL. If you are interested, please call directly to the dealer at 708-331-5533 or check its listing page to see more pictures and detailed information about its overall condition and mileage. The second generation was produced from 2004 to 2010. Is advisable to seek from 2005 onwards (manufactured after February 2005), since, starting from these models was when Toyota strengthened the structure and improved the lateral side airbags which became standard equipment on all versions from 2006. Before this year, they were part of the standard equipment only in the XLE Limited trim model. From 2004 to 2006, the Sienna used a 3.3-liter V6 engine with 230 horsepower. Due to changes in the system of power measurement, the official number dropped to 215 in 2006 although the acceleration and performance didn't suffer any change. From 2007 to 2010 it used the well known 3.5-liter V6 engine with 266 horsepower. DEAL #3 - TOYOTA SIENNA LE UNDER $3k. This Sienna minivan gold color, is a year 2000, has 167k miles, and is being sold for only $2,632 by Frank Shoop in Georgetown, Kentucky KY. If you are interested, please call directly to the dealer at (502) 863-3727 or check its listing page to see more pictures and detailed information. The second generation of the Sienna had four equipment versions: CE, LE, XLE and XLE Limited. Most buyers of used minivans will be satisfied with the CE or LE, and these are the versions to look for if you are interested in the one which has space for up to eight passengers, as these ones have a three passengers seat in the second row, instead of two individual seats. The middle part of the bench seat slides forward to give parents better access to a baby in his seat. 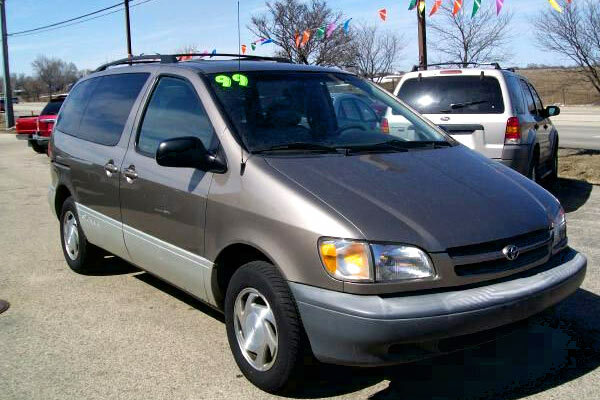 DEAL #4 - '98 TOYOTA SIENNA LE BELOW $3000. 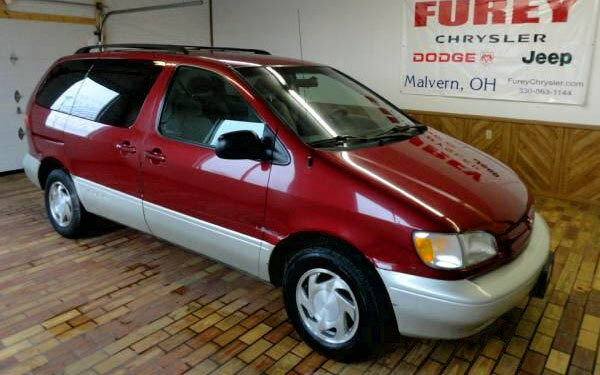 This really nice, well cared, clean in/out outstanding Sienna minivan red color, is a year 1998, has 272k miles, and is being sold for only $2,656 by Furey Chrysler Dodge Jeep RAM dealership in Malvern, OH. If you are interested, please call directly to the dealer at (877) 658-3848 or check its listing page to see more pictures, contact and detailed information. The Sienna is one of the best minivans on the market. 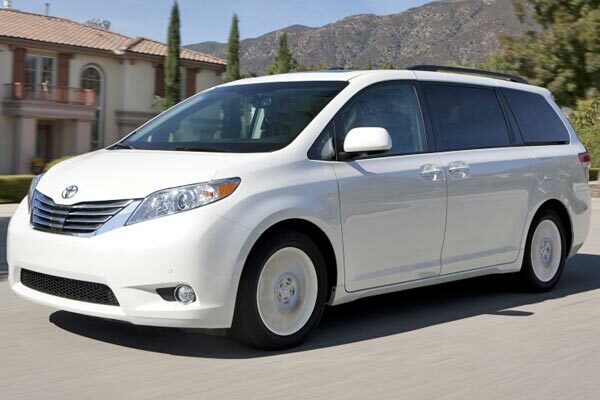 Besides receiving scores above average in the crash tests, the Sienna was one of the few minivans that featured the choice of 8 or 7 passengers. Also offered the unusual choice in the U.S. market of four-wheel drive and part of the equipment of the most luxurious versions included power speed control and power folding third-row seats. DEAL #5 - 1999 TOYOTA SIENNA XLE FOR LESS THAN $3000. 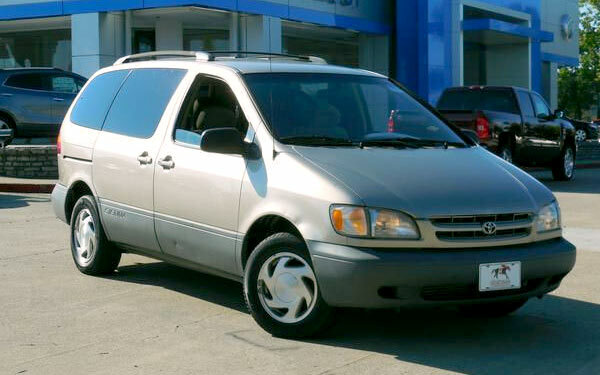 This superB used Sienna XLE '99, tan color, is in pretty good looking condition, has 163k miles, and because of its trim premium model, and its overall condition, this is best deal of all just mentioned. It is being sold for only $2,799 by Retek Auto Sales, Inc. dealer located in McHenry, Illinois IL. If you are interested, please call directly to the dealer at (815)363-7090 or check its listing page to see more pictures, and detailed information. As for handling, the second generation of the Sienna felt agile and refined, especially when it was equipped with the 3.5-liter V6. For those looking for a used minivan with class and versatility, Sienna must meet their expectations. The current generation of the Sienna started be sold from the 2011 model. Now that you know that it does is possible to get a really good, reliable and cheap minivan for less than $3000 dollars like the Toyota Sienna, and in case you aren't located in Kentucky, Illinois, Ohio, or Iowa where are located, these bargains from above, I hope you can find some other similar or better deals near where you live.